Hydrangeas began blooming last week and I am thrilled. The flowers have a way to go before they are fully open but I could not wait. Hydrangea macrophylla generally bloom on old growth. In the previous two years late cold snaps ruined the buds, so this is the first promising display ever from these passalong shrubs. 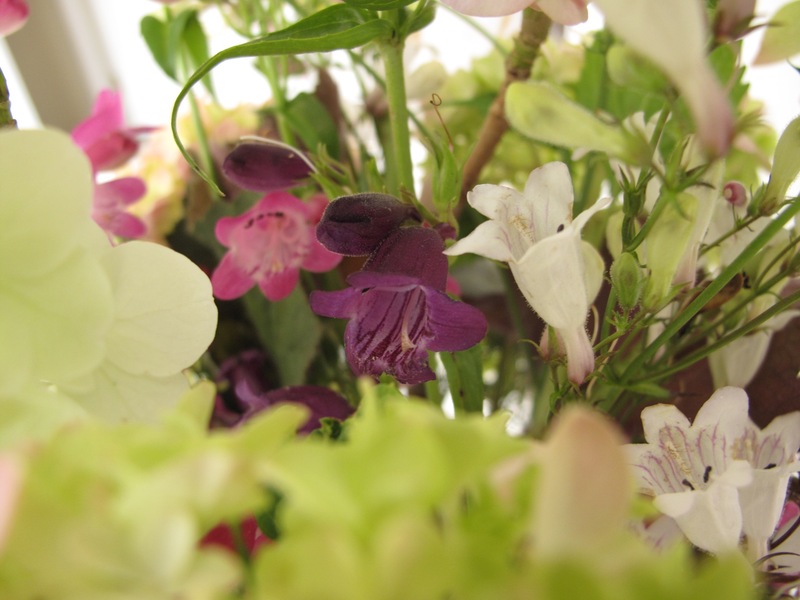 Often arrangements of flowers require many more blooms than one would expect. I had to return to the garden to snip a few extra hydrangeas to complete the vase. These flowers were so luxurious and satisfying to arrange. Perhaps an odd use of concealer foliage, I first lay out a collar of pink achillea around the perimeter of the vase and then added the layer of leaves above. I chose Heuchera villosa ‘Big Top Bronze’ for its beautiful red coloring on the undersides of the leaves to complement the other pinks and reds in the arrangement. Penstemons are also blooming this week and I used several colors as filler flowers. Husker Red has dark red foliage with white flowers and self-seeds generously. Pike’s Peak Purple is my favorite. Originally planted along the path of the meditation circle only one plant remains there. Last summer I managed to divide it and plant a piece in a section of the border, where it is blooming but not really thriving. Red Rocks is the third penstemon, and as is often the case with plants named “red,” the bloom color is pink, not red. Red Rocks is blooming well though. 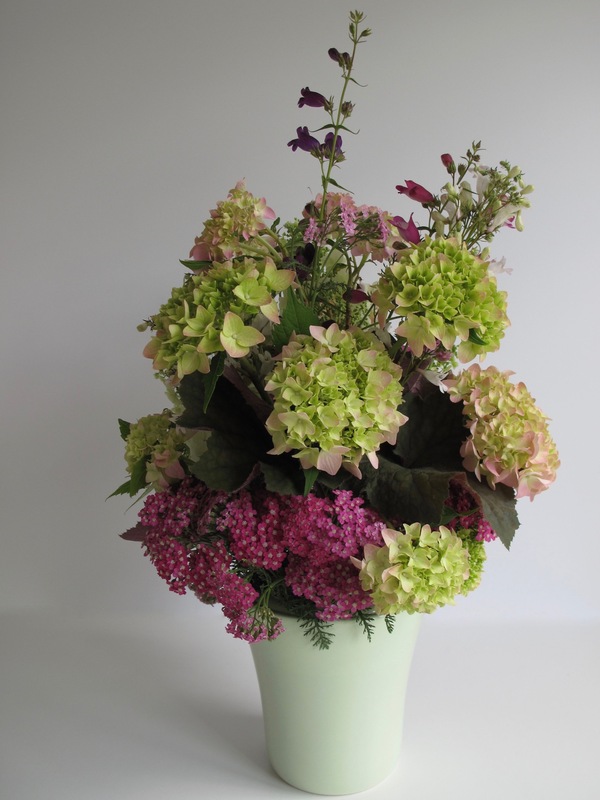 Also featured in today’s vase are three stems of Hydrangea quercifolia ‘Ruby Slippers’. These large clusters of oak leaf hydrangea, which open white, should gradually turn pink and eventually darken to a rich dark rose. This has never happened. Instead the flowers turn brown and dry up before reaching that stage. Maybe there will be enough rain to keep the plant happy this year. I found a new ceramic vase at my neighborhood’s garage sale a few weeks ago. The selling point was its matching lid with holes to help secure the flowers, like a flower frog. The lid works but with limitations. To begin this design I edged the container with a low soft border of Achillea filipendulina (Fern-leaf Yarrow). Supported by remnants of feathery foliage, the achillea stayed precisely where I put it. But the taller, heavier hydrangeas were less cooperative. At the beginning the hydrangea stems had a lot of wiggle room in the openings, shifting around and adjusting as I inserted other flowers. Eventually I managed but this arrangement might have been easier with a stronger base of Oasis or another anchoring system. The lid does lift up easily to add fresh water. This view shows how the initial edging of achillea and heuchera leaves support the hydrangeas in the arrangement. The pink color of my mophead hydrangea is surprising. I grew up in an area where hydrangeas were always blue. I have never had the soil tested here but there are plenty of pines in the neighborhood so I had assumed the soil was acidic. When Jayme gave me the plants, I think there were 2 or 3 blue flowers the first year, 2013; 1 or 2 small pale blue ones in 2014; 1 or 2 small white ones, 2015. So the flower color has been transitioning as the plants grew and became established. 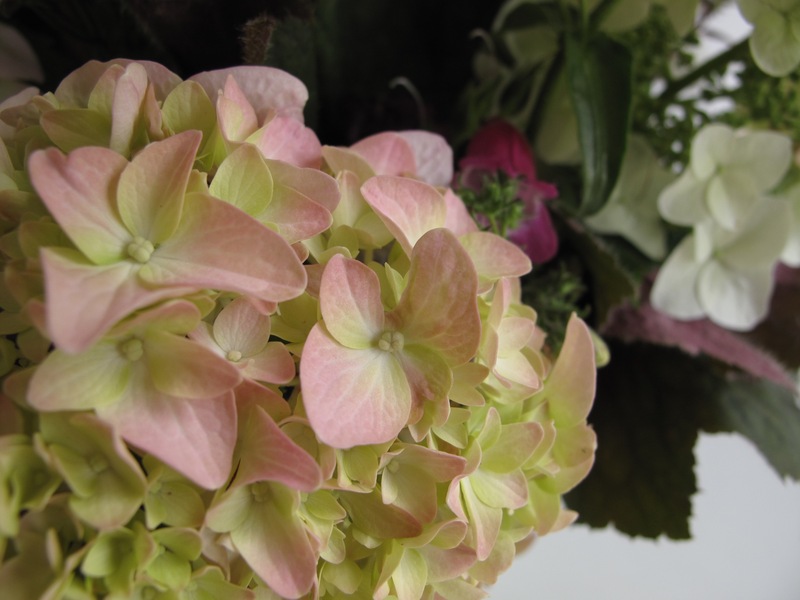 For blue flowers hydrangeas require acidic soil (pH 5.5 or lower) and for pink, neutral to alkaline (pH 6.5 and higher). To change pink to blue flowers, applying aluminum sulfate to lower the pH and add aluminum to the soil is recommended. You deserve a medal if you managed to read this far. Thanks for stopping by. And as always, thanks to Cathy for hosting this weekly flower obsession. Visit her at Rambling In The Garden to discover what she and other gardeners are placing In A Vase On Monday. This entry was posted in garden and tagged flower arranging, flower design, Hydrangea macrophylla, Hydrangea quercifolia 'Ruby Slippers', in a vase on monday, nature photography, penstemon on May 23, 2016 by pbmgarden. 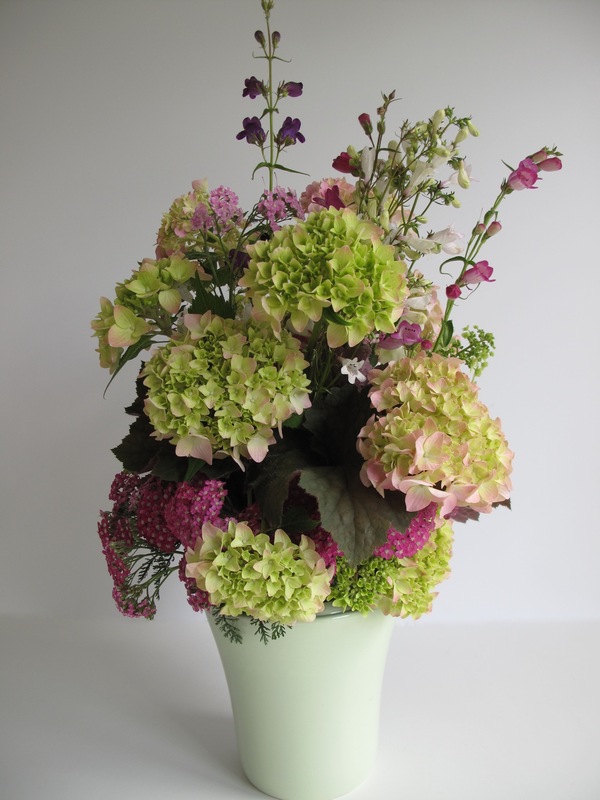 A fabulous vase Susie, opulent with the hydrangeas. 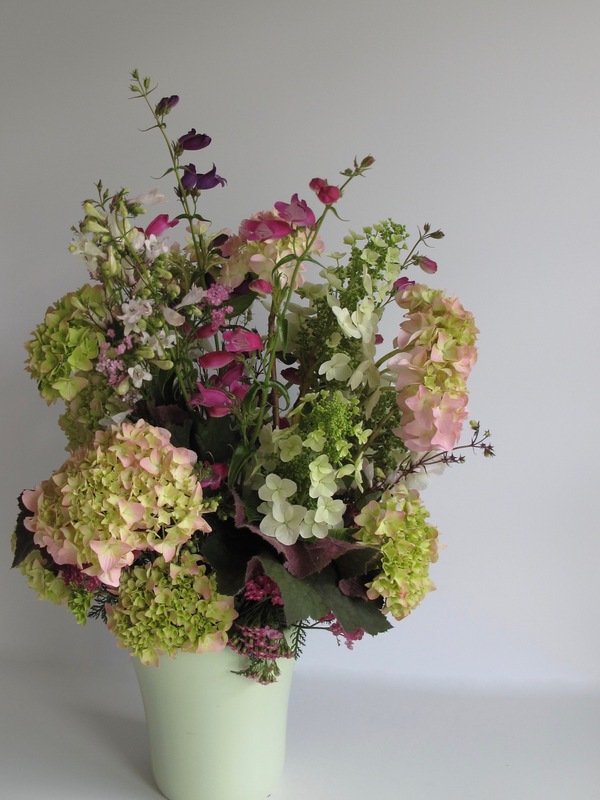 I don’t often see hydrangeas mixed successfully with other flowers but this vase works brilliantly. 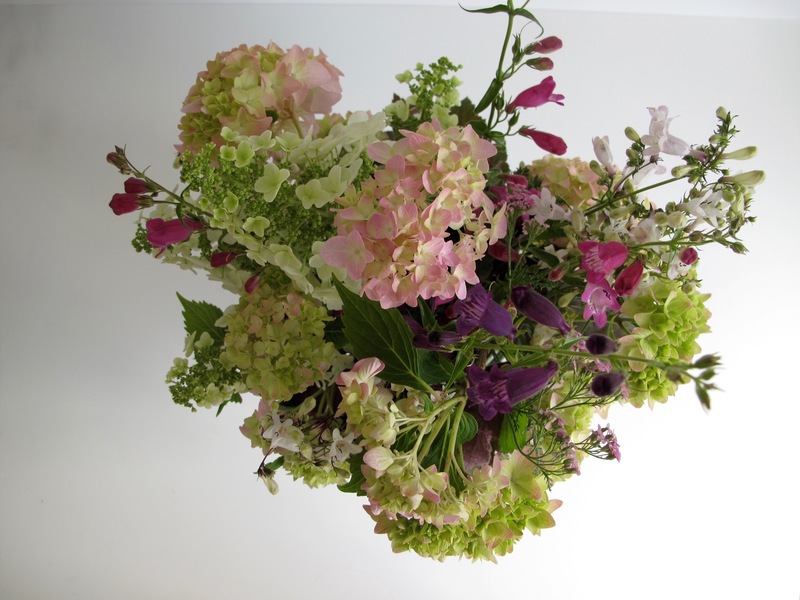 I have also been experimenting with using more different flowers in my arrangement for this week. You could try my trick of adding pebbles in the base of the vase to help position the heavier stems. Thank you Christina. Good tip to use stones to hold the flowers. Working with the hydrangeas was such a pleasure after struggling to get them to bloom for several years. One of my favorites too Judy. Look forward to seeing your blue ones and maybe I’ll get started turning these back to blue. I have never had luck with Hydrangeas so I am always in awe of having them in a bouquet. The Achillea works well with them which I never would have thought of. And I love how there is a Heuchera leaf that seems to fit every situation. Linda, this is my first year having success with hydrangeas so I too am in awe. Your talent amazes me! And makes me want to paint your arrangements :)! Bev, I’m thinking of pulling out my paints too. So happy to see the hydrangeas this year. A lovely vase, as usual, Susie. Our hydrangeas are blooming out now as well. I really do like your use of the heuchera foliage. Thank you John. That heuchera recovered nicely from a harsh time the past year. Bravo! Love these colors together. Hydrangeas do not do well here at all, so I am envious. Thank you Karen. One of the fun challenges of these Monday vases is pulling together plants that might work together. Wasn’t sure the yarrow or heuchera would make it into the final vase, but glad I went ahead with them. Thanks for your comment today. I enjoyed your post, Susie. The arrangement is lovely as usual and I admire that clever vase – what a great find! As I read the posts of the “IAVOM” meme, I always think I need to get out and scour the local shops for new vases but somehow that still hasn’t happened. The pink Hydrangeas with their touches of green really make a statement, making me wish that there was some way to grow Hydrangeas here. I miss them. Thanks Kris. 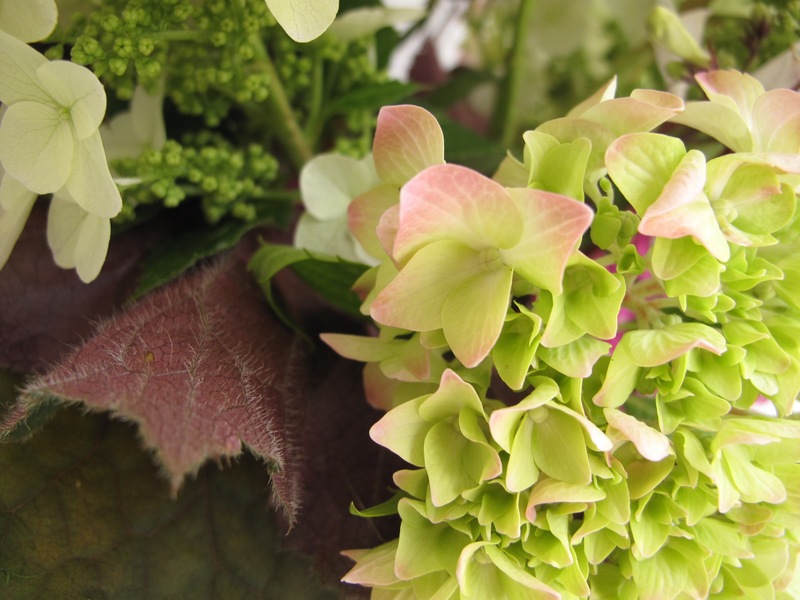 Is it the heat or water needs that keep you from growing hydrangea? The vase was $3–not bad. I used to pick up little ceramic vases at local street fairs many years ago and several of those are my favorite ones. Such a nice comment Cathy, you’ve boosted my confidence. Actually, here hydrangeas are terribly expensive to buy, so it’s nice to finally grow some in the garden. As you might expect from me the achillea is a passalong, which usually means it spreads quickly and easily. It would be worth a try to experiment with growing your wild version, just put it in a place where you can contain it. Thanks. Have a great week. You know I should have been hitting a few local garage sales to look for vases…that one is fabulous. I love how you built up with the hydrangeas….I doubt I will have any this year as all of them have had to grow from the base with the warm March and very cold freezing April temps that killed them all the way to the base. Donna, it’s a shame about you hydrangea. What kind do you grow? Those newer fancier hybrids that can bloom on new and old growth would be for you. I’m thinking of looking for some like that that might be more dependable. 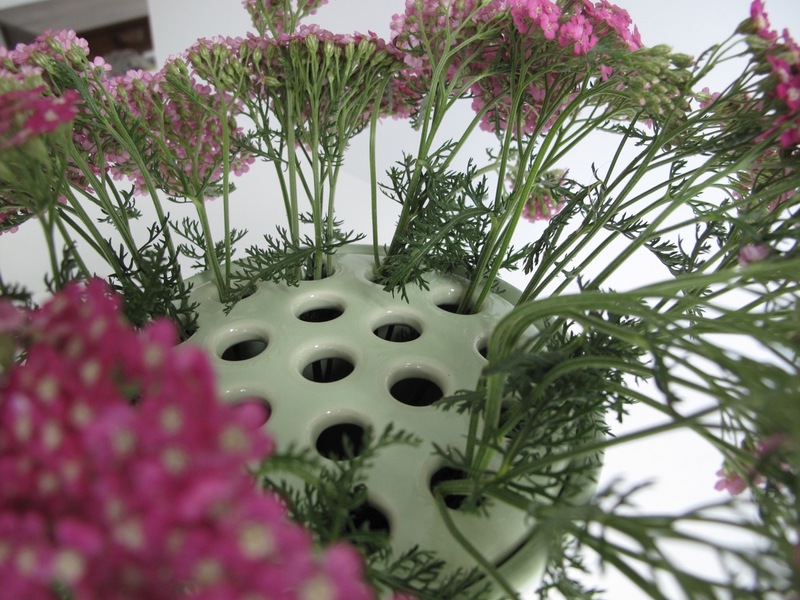 Yes, these vases with the holes seem such a good idea but in practice don’t always work as well as you think they will! You succeeded in the end though and it was most interesting to read through the process and about the different blooms – we learn such a lot from information like this so thank you for sharing. 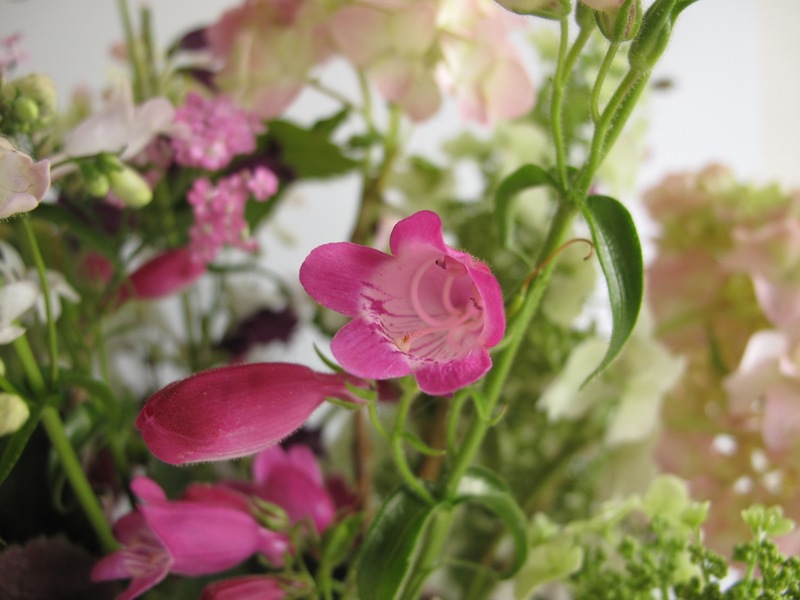 The penstemon work really well with the hydrangea, and the collar of achillea was such a good idea. Cathy, I realize this was a long post this week (maybe next week a one-liner?). Glad you found something useful. Necessity leads us to new places. If I’d had enough hydrangeas I might not have added any other materials to the vase. In the end it was nice to work in the other blooms. Thanks for hosting. What a lovely abundant vase, Susie! The hydrangeas are so fabulous with all their tiny florets, and the chartreuse and magenta colors go so well together, especially with the magenta tinges on the edges. I have a pet peeve about nursery color names, there is the computer color system Cyan Magenta Yellow which is ignored in botanical color names, the shades magenta are usually described in terms of the Red Green Blue system system and tend to be called blue or red, yet it is a very abundant flower color, but the name is not recognized. I hope I get some flowers from my hydrangeas this year, I want to try to dry some, but they are not that full pom pom shape. I made a little vase recently, not fired yet, with holes on top but no removable part so I don’t know if it will really inconvenient to clean or not. I liked your steps in building up a full arrangement. Thanks so much Hannah. I agree with you about the botanical color names. Red, green and blue does not begin to capture our bloom colors. Hope you’ll have lots of hydrangeas to dry. It is a treat to be able to keep them around after their season. The vase sound nice and useful–perhaps a tiny bristle brush will do the trick to keep it clean. Will miss your posts. Take care. 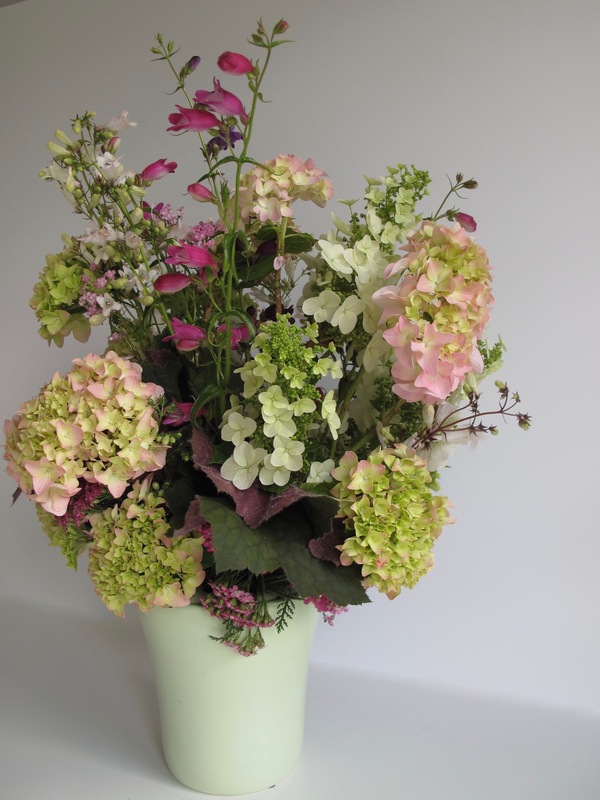 A beautiful vase Susie – the hydrangeas are at my very, very favourite stage and look perfect with the H. quercifolia and the penstemons for a stronger touch of colour. 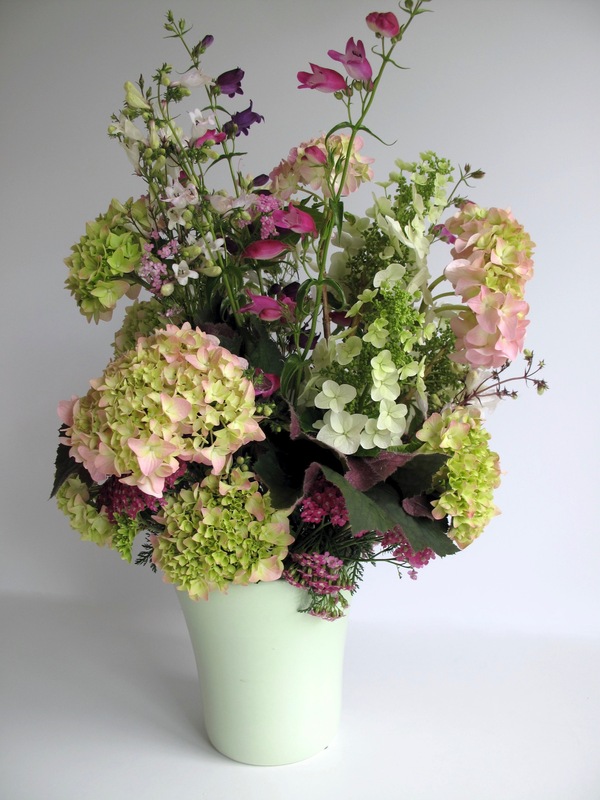 So much information in the comments above as well – pebbles in the bottom of the vase to help support strong stems! Well done Christina for sharing that idea. Your vase was a great find, wasn’t it? I keep looking for something like that, but am reduced to chicken wire (which works ok, but can be tricky with thorny roses). It was good to see your ‘process’ – and brilliantly photographed as Cathy says. Thank so much Cathy. Hope the hydrangeas continue to open fully. Couldn’t wait to use them so took the chance. Chicken wire probably works great and perhaps is even more flexible than this ceramic lid. The new vase was a good find indeed and turned out to be plenty heavy to hold these hefty flowers without tipping over. Gorgeous, hydrangeas are something special and yours are lovely. It would be interesting to find the pH of your soil. Any Pink varieties I ever tried turned blue in my Georgia garden. I had extremely well draining clay and a difficult time with the Hydrangeas except for Oakleafs ‘Snowflake’ or PeeWee varieties. Thank you. I know in my old garden the hydrangeas would have turned blue also. It may take a while but I’ll probably try spreading our coffee grounds around them. You might want to consider Miracid or Hollytone?! ‘Ruby Slippers’ goes beautifully with the red yarrow. I like ‘Ruby Slippers’ a lot. It’s a dwarf oak-leaf hydrangea. That yarrow is long-lasting when cut, which almost makes up for how much it spreads everywhere, creating lots of work for me. A beautiful vase, it’s so full and rich! The hydrangeas look great and I can’t believe they are blooming for you already (ours are only just now sprouting leaves after a harsh freeze killed all the buds off). I was surprised to see the hydrangeas blooming now too but don’t have an immediate reference point to know if they’re early. Hope you have the kind that bloom on old and new growth so you’ll have some blooms. Penstemons are evergreen here (at least Husker Red is) which is a nice benefit of using them. I’ll take that medal now, but don’t really deserve one, as this was all very interesting as well as beautiful. How did you condition the Hydrangeas? I always find that they wilt quickly when picked fresh. Medal awarded, thanks Ricki. Conditioned the hydrangea in cold water for a couple of hours. Maybe overnight would have been better. Three or 4 didn’t make it–one collapsed right away before I started arranging. The others on the 2nd day but I believe there stems weren’t reaching the water. Others still look fine, so don’t know the answer. Your arrangement has never ceased to amaze me. You’re very kind! I must admit this one is a personal favorite.